I was doing my usual weekend gallery walk-a-thon when I started thinking about dogs. Thinking about dogs in DC, even if you haven’t got a dog of your own to think about, is pretty much ubiquitous. Because the dogs are. Ubiquitous. 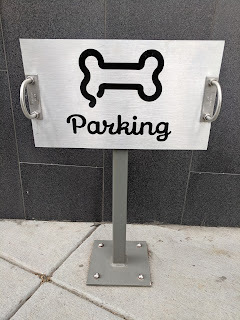 And because I see art in everything, I am acutely aware of the role dogs play in the urban streetscape. In his sociological treatise, The Presentation of Self in Everyday Life, Erving Goffman talks about the “maintenance of front,” a concept Italians call “bella figura.” DC dogs take the art of self-presentation seriously. They trot, prance, lope, wearing their scarves, bow ties, and headgear with a seriousness of mien and aplomb that belies the somewhat unorthodox choices of apparel in which they appear. Like the ID badges sported by the seriously connected (read: everybody) dogs confer identity to their owners/caregivers. They hang around WeWork offices. Judiciously partake of water and treats left for them by fawning businesses. Patrol happy hour hotspots. And confer upon their owners the status so necessary for DC happiness. We in the art world are proud to acknowledge that one of our own has made it to the top: Cross MacKenzie’s beloved gallery dog, Zeke, who belongs to gallery owner and artist Rebecca Cross, was named Best Gallery Dog by the Washington City Paper.